Bob Downing is pictured with the House in session on Thursday. CONCORD — The House approved a new, two-year $12.9 billion operating budget Thursday that supporters said would benefit all New Hampshire citizens and communities. But opponents claim the budget was deeply flawed for spending one-time money on “growing government” rather than using the surplus for one-time projects that Gov. Chris Sununu proposed. The operating budget passed on a 225-159 nearly party line vote and the trailer bill with changes in law needed to implement the operating budget passed on a similar 224-168 vote. The House budget package sets up a collision course with the Republican governor with a new capital gains tax, repeals future business tax rate reductions, eliminates a new secure psychiatric unit facility, and does away with over $100 million in one-time spending for new and renovated Health and Human Services facilities, projects that benefit a couple dozen communities and victims of a financial fraud case that occurred a decade ago. The two budget bills move to the Senate, which will craft its own version of the budget which may be more appealing to the governor, but probably not enough to avoid a gubernatorial veto. On Thursday the budget debate was a tale of two cities as Democrats said they crafted a budget that fulfills long neglected needs like mental health and child protection services, while providing property tax relief, and begins to address the education funding system that has property-poor school districts in crisis. But Republicans argued the budget would put the state in a financial hole similar to a decade ago when the Republican-controlled legislature slashed higher education and social services, and taxed hospitals to close a budget gap of hundreds of millions of dollars. Republicans said House budget writers should have included the one-time capital projects the governor proposed in his budget such as the $26 million to replace the secure psychiatric unit at the state prison, and numerous renovations and construction projects in a couple dozen communities. And they said there is no need to increase state taxes more than $400 million by repealing future business tax rate cuts and instituting a capital gains tax when revenues are expected to increase $1 billion during the next biennium. But Democrats said they heard constituents ask for property tax relief, expanded mental health and opioid treatment programs and to stop downshifting costs to local communities. They said after 10 years, revenue sharing should benefit all communities not just a couple of dozen the governor singled out would be re-instituted. They also answered criticism over what they left out of their proposed budget: not funding the Internet Crimes Against Children program and removing $26 million for a new secure psychiatric unit. On a 376-4 vote, the House approved an amendment providing $500,000 for the Internet Crimes Against Children program run by several police departments to snare would-be predators through the use of social media. Sununu, law enforcement representatives and Republicans criticized the Democratically controlled House Finance Committee for removing the money from the governor’s budget. A federal grant funded the program the past few years, but House budget writers said the Attorney General’s Office did not make it a priority in its budget so it was dropped from their plan. Sununu also criticized House budget writers for failing to fund his proposed secure psychiatric unit saying patients’ families have waited years for the program to be moved out of the state prison and countless study found the need for a new facility. The House voted 220-159 to spend $1.2 million for engineering and architectural work that would allow the facility to move forward. 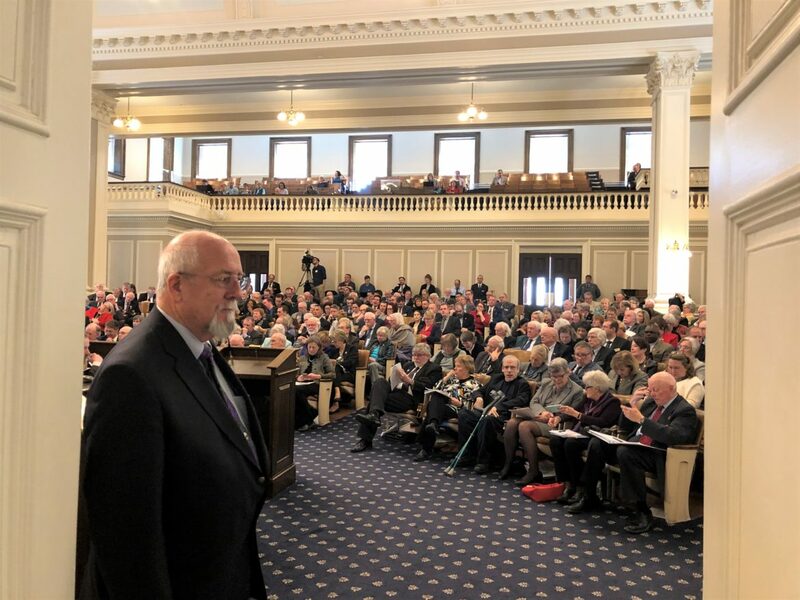 A long-time advocate for the change, Rep. Renny Cushing, D-Hampton, said the state has housed its most vulnerable citizens who are a danger to themselves and others in a prison. The House Finance Committee said the governor’s office failed to provide sufficient information to make a responsible decision on the facility. The House voted down proposed amendments to significantly reduce state education aid for school districts and strip funding from an education funding study commission, and to switch the family and medical family leave program approved by both the House and Senate with the two-state program proposed by Sununu for state workers. Republicans repeatedly said the budget was not sustainable and would send the state into financial ruin. Democrats emphasized their plan benefited everyone, not just those chosen by the governor for special projects or large businesses. The House made quick work of the $124 million capital budget of construction projects throughout the state, approving on a bipartisan 362-5 vote, unlike the operating budget. About $35 million of the capital budget is for higher education and technical education construction. There is $14.5 million reserved for renovations at the Hudson Career and Technical Education Center and $4 million to complete the Rochester CTE center. The University of New Hampshire would receive $10 million this year for renovations at Spaulding Hall, and $32 million over the next two fiscal years to renovate Hyde Hall at Plymouth State University and the Elliot Student Center at Keene State College. The capital budget also allocates $23 million for upgrades at various state buildings, $7.1 million for park renovations and projects, and $700,000 to upgrade the boat ramp at Sunapee State Park in Newbury. Also money is allocated for information and computer systems for several agencies and divisions. Other money would help rehabilitate state-owned rail lines and and to purchase buses for mass transit. “This is a jobs bill that will create economic opportunity,” said House Public Works Committee chair John Cloutier, D-Claremont.